The DMACK ST Trophy headed to Wales for the Nicky Grist Stages. Seven crews arrived in Builth Wells to tackle the tough gravel roads over the Epynt Military Ranges. Sam Bilham and Cameron Fair just had to finish on the podium to clinch the 2017 ST Trophy title so they were under pressure to drive a calculated rally. Alasdair Currie and Steven Brown were unsure if they would make the event but eventually managed to secure the funding to continue their championship campaign. Fellow Scotts Finlay Retson and Tom Hynd had decided to continue their learning curve within the championship after their podium success on the Carlisle Stages. Jon Ambler returned to the championship after missing the last round and was teamed up again with Doug Chivers, the pair were hoping to take back the 2nd place position they had previously held in the championship. Rhydian Price and Peredur Davies made a welcome return and were looking forward to the event on local turf. Guy Butler and Jamie Mactavish were planning on building up their pace, as on the last round their confidence had been knocked following their roll on the Plains Rally. Martin Laverty had again made the trip over from Ireland and with Phil Kenny on the notes, the pair were keen to score points here in Wales. Alasdair Currie and Steven Brown set the initial pace over the first three stages. Sam and Cameron had been pushing them hard but with Sam mindful of the championship, he was happy to hold 2nd place at this point. Disaster then struck for Currie in Stage 4 when a stub axle failed resulting in them losing a rear wheel and the car ground to a halt. Sam and Cameron's hopes of taking the championship title then took a blow when they started struggling with gears on a road section and then the car finally sticking in one gear for the whole of the final stage of the morning. The crew managed to nurse the car back to the mid point service at the Builth Wells Showground where the team worked against the clock to repair the problem. Jon and Doug's day didn't start too well either having a bottom ball joint shear off less than a mile into Stage 2. Jon managed to repair the problem and continued but sadly was OTL so were out of the event. Finlay and Tom were having a clean run and using the event to gain experience of both the car and the stages, Tom still under instructions from the team to rein Finlay in to make sure they got the full mileage under their belts and gain as much experience as possible. Rhydian and Peredur were also out to learn the car and gain experience, the all-welsh crew having not yet made it to a finish line this year due to mechanical woes so had admitted the plan was to just enjoy the rally and get to the finish. Both of these young crews had a clean run through the morning stages. Martin and Phil's engine unfortunately cut out mid way through Stage 4 and despite their best efforts were not able to find the problem so they became the 4th car to retire from the event during the morning. Guy and Jamie had a steady start but were getting quicker each stage and the memory of that roll becoming more and more distant with every mile covered and by service had decided they were going to attack in the afternoon and try for a podium finish. The afternoon stages were a repeat of the morning loop. All of the crews were aware of the now deteriorating condition of the stages so would be looking for clean lines to avoid the large rocks pulled out by the more powerful British Championship cars running ahead. 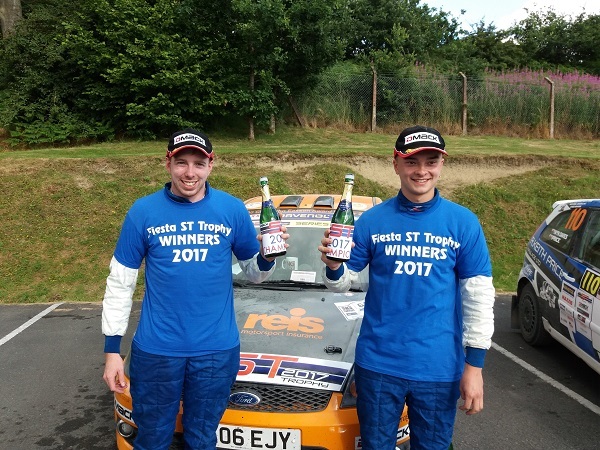 With the orange Fiesta ST back on form after its gear selection issues of the morning, Sam and Cameron had a faultless afternoon, conserving their tyres through the final stage they arrived back at Builth Wells with a convincing 5th consecutive victory. This also sealed their overall victory in the ST Trophy and so becoming 2017 DMACK ST Trophy Champions. Finlay and Tom had opted for soft tyres on this event so with tyre wear an issue, they were pleased to make it home safely in an excellent 2nd place - a great resulting considering this is only the 17 year old's 2nd forest event. Rhydian and Peredur, the coolest looking team in the ST Trophy were really pleased to get to the finish with miles under their belt that they so desperately needed. Not only that, they were also over the moon to have taken the 3rd place on the podium. Guy and Jamie had upped their pace to such an extent that they clawed back 17 seconds in the final stage to finish just 1.8 seconds behind the cool welsh crew, narrowly missing out on a podium position. The champagne tasted that extra bit sweeter for Sam and Cameron on the podium with both event and championship victories to celebrate. Congratulations go to Sam & Cameron from the ST Trophy Team. 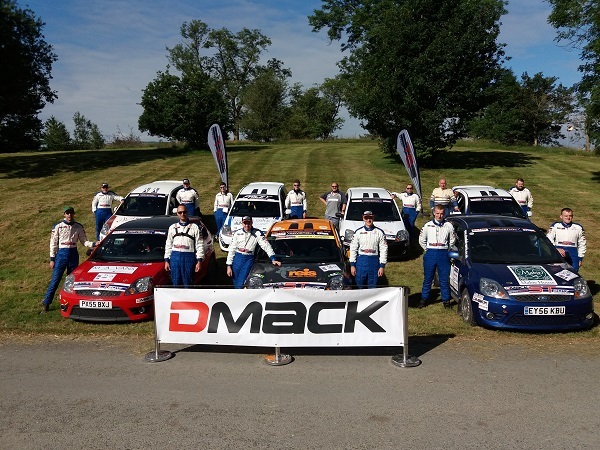 The crews now have a short summer break before the penultimate round of the championship which takes place at the Woodpecker Stages on 2nd September in Ludlow.